With the number of endangered orcas that frequent the inland waters of Washington state at a 30-year low, Gov. Jay Inslee on Wednesday directed state agencies to take immediate and longer-term steps to protect the struggling killer whales. The fish-eating mammals that spend time in Puget Sound have struggled for years with a lack of food, pollution, noise and disturbances from boat traffic. There are now just 76 of the orcas, down from 98 in 1995. Inslee said the orcas are in trouble and called on everyone in the state to do their part. His executive order aims to make more salmon available to the whales, give them more space and quieter waters, ensure they have clean water to swim in and protect them from potential oil spills. An orca task force forming now will meet for the first time next month and will come up with final recommendations by November. Many have been sounding the alarm for years about the plight of the closely tracked population of southern resident killer whales. The federal government listed the orcas as endangered in 2005, and more recently identified them as among the most at risk of extinction in the near future. 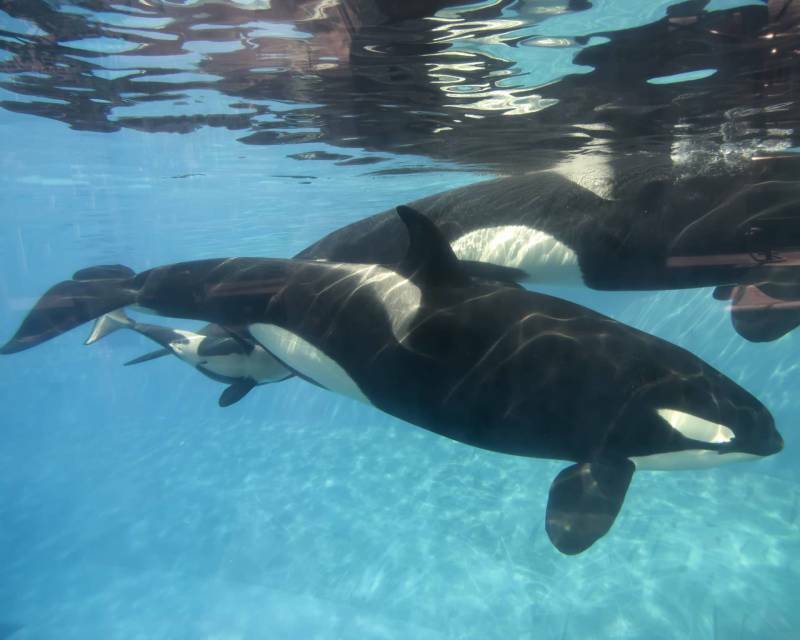 A baby orca has not been born in the past few years. Half of the calves born during a celebrated baby boom several years ago have died. Female orcas also are having pregnancy problems linked to nutritional stress brought on by a low supply of chinook salmon, the whales’ preferred food, a recent study said. The whales use clicks, calls and other sounds to navigate, communicate and forage mainly for salmon, and noise from vessels can interfere. Lawmakers also passed a supplemental budget last week that includes $1.5 million for efforts such as a boost in marine patrols to ensure that boats keep their distance from orcas and an increase in hatchery production of salmon by an additional 5 million. Last year, the endangered orcas spent the fewest number of days in the central Salish Sea that spans Washington and Canada in four decades, mostly because there wasn’t enough salmon to eat, according to the Center for Whale Research, which keeps the whale census for the federal government. “I applaud anything that helps (the orcas) through the short term, but the long term is what we really have to look at — and that’s the restoration of wild salmon stocks throughout Washington state,” Ken Balcomb, senior scientist with the center, said Tuesday. Balcomb and others say aggressive measures are needed and they have called for the removal of four dams on the Lower Snake River to restore salmon runs. J.T. Austin, the governor’s senior policy adviser on natural resources issues, said Inslee so far does not support removing those dams.